Town branding. Creation and design of advertising campaign, merchandise and promotion of environment. Scroll to discover more. 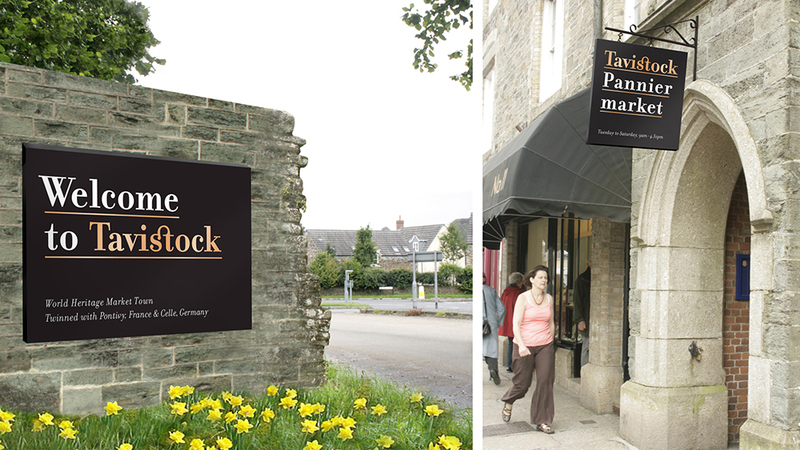 To create a brand promoting the town of Tavistock, celebrating the unique offering of an independent, premium shopping experience set within a historic market town. Tavistock gained its wealth during the 1800s through its role as a stannary town for Dartmoor’s copper mining. Not only did this inspire the current architecture, but also our choice in typeface, colour and visual appearance. A branded language sought to contrast commonplace mass market shopping terms with a quirky response to highlight Tavistock’s unique offering of a real shopping experience. A brand that has the potential to grow, giving a consistent voice to the town and for the visitor journey. Many examples, such as those shown here, can be put into effect over time and as budgets allow. Advertising contrasted commonplace mass market shopping terms with a quirky response to highlight Tavistock’s unique offering as a real shopping experience. Concepts for updated signage around Tavistock, considering visitors' journey from beginning to end and back again.